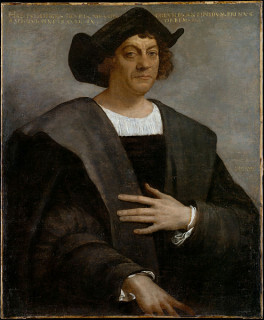 For many years, Christopher Columbus was given the credit for discovering America. That's not exactly true! Find out a little more about him and enjoy our colouring pages and printables below. Columbus was born in Genoa, Italy, in 1451, to a merchant family. From an early age he was ambitious and adventurous, and believed he had been chosen to achieve great things. He began sailing as a young teenager and learned about map-making and navigation. Columbus decided to seek his fortune by finding a quicker, easier route to the East Indies, which was where all the exotic spices were found - and spices meant great wealth at the time! He thought that the world was much smaller than it actually was, and that if he sailed west from Europe he would reach the East Indies, quicker than it could be reached by land along the increasingly dangerous Silk Road. He needed a sponsor for his explorations and went unsuccessfully to the kings of Portugal, England and France before finally persuading King Ferdinand and Queen Isabella of Spain to pay for his voyage. Columbus set sail from Spain in august 1492 with three small ships - the Santa Maria, the Pinta and the Nina - and just 90 men. The ships stopped first in the Canary Islands to restock, and then set out across the Atlantic in September, reaching an island in the Bahamas on 12th October. Columbus named the island San Salvador and called the people he met there "Indians" because he was convinced he had reached the East Indies. He then went on to reach Cuba, which he thought was China (or Cathay, as it was called then) and Hispaniola. At Hispaniola the Santa Maria ran aground and had to be abandoned, so he left some of his men there to establish a colony and returned back to Spain, where he was received as a hero. The following year he set off on his second voyage with 17 ships and 1200 passengers! He made four voyages to the New World in total, establishing settlements and discovering and naming many islands of the Caribbean and coastal regions of Central and South America along the way. His career ended in disgrace when he was accused of tyranny and incompetence and taken back to Spain in chains. Although he was later freed he became increasingly unwell in later life and died, aged about 54, in 1506, a very wealthy man. No! The first European to land in North America was a Viking, Leif Ericson, around 1000 AD. And of course the land was already populated by Native Americans. His voyages were, however, the beginning of the European exploration and colonisation of the Americas. Christopher Columbus never realised that he had reached a "new world" and died convinced that he had sailed west to the East Indies. When another Italian explorer, Amerigo Vespucci, realised what had happened, the New World was named after him - America. Rather than being remembered as a "hero", these days we know that Columbus committed many brutal and terrible atrocities against the native people he encountered, and took many into slavery. For Columbus Day or a history project here's a Christopher Columbus poster for you to print and display. This Christopher Columbus colouring page has a rhyme to help children remember the date. Thanks to this little rhyme I will always remember the date of Christopher Columbus's journey so here's a poster to help children remember it too. Print and fold our Christoper Columbus booklet following the instructions here and use to record your research. Our foldable booklets lend themselves well to lapbooking or perhaps you could build up a mini library. This Christopher Columbus Captain's log writing prompt asks children to imagine that they are Columbus sighting land for the first time. What might he see? What might he feel? Can he spot land yet? This simple Christopher Columbus colouring page will be a fun addition to a US or Explorers history project for young children. This Christopher Columbus comprehension worksheet is aimed at older children. They need to read the text and use it to answer the questions. Write a newspaper report on Columbus's 'discovery' using our Christoper Columbus newspaper writing prompt. We have two versions: one includes a headline and the other has the added challenge of writing your own headline. Choose between lined or handwriting lined versions of our Christopher Columbus story paper,with a picture to colour and lines to write on. Use for creative writing or just copying a sentence or two. Here's a fact finding worksheet on the explorer Chrisopher Columbus. It would be a good introduction to a project for young children. Our Christopher Columbus writing page is perfect for children to record their own research. Do they know where and why Columbus was sailing? With this fun extention activity to a history project, children can follow our step by step tutorial to learn to draw the explorer Christopher Columbus. This simplified map shows Christopher Columbus's four voyages across the Atlantic Ocean in his attempts to find a quicker route to the East Indies. Instead he bumped into a "new" continent!